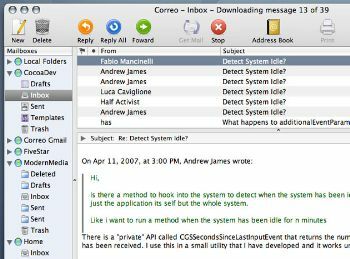 If you’re looking for an open source email client for MacOSX, Correo could be what you’re looking for. It supports IMAP/POP, and MacOSX Address Book integration and your usual mail client abilities. What I love about this is that they have IMAP Enhanced support in. This means that you can actually use subfolders in your mail account without having to download all the mail messages. Makes it handy for synchronizing mail with multiple devices. Correo is also planning on implementing portable device synchronization such as PDA mail and some other very useful features. Currently the version dictates that this project is very young, but it basically blends both of Mozilla’s projects in Thunderbird and Camino together. If anything, this should remind you why Outlook takes the cake for much of the email client market, and why others upon other operating systems are starting to come up with certain features that are corresponding to the mature Windows email client.